Kingdom Hearts: What Happened to Tech Points? – What's in a Game? Tech Point was a mechanic that added small elements of strategy to each battle, but how come no other Kingdom Hearts game used this system? Why was it such a useful feature and how could future games improve on it? Let’s discuss! What’s Great About Tech Points? On the surface, Kingdom Hearts has a simple combat system. Goals for the player are simple – kill the enemy without dying. The game has an optimal strategy that makes it easy to win – attacking and curing when you need to. The developers made it simple on purpose so kids unfamiliar with RPGs would get into Kingdom Hearts because they loved Disney. But what about high-skilled players that wanted something more complex? Tech points are a form of challenge layering. Players already have a primary goal – kill the enemy without dying. In several enemy encounters, receiving tech points are an alternate goal for players to pursue adding an interesting decision for players to make in the heat of battle. Players pursuing tech points will put themselves in riskier situations, such as relying on parrying or guarding instead of taking the easy way out and dodge rolling away from harm. 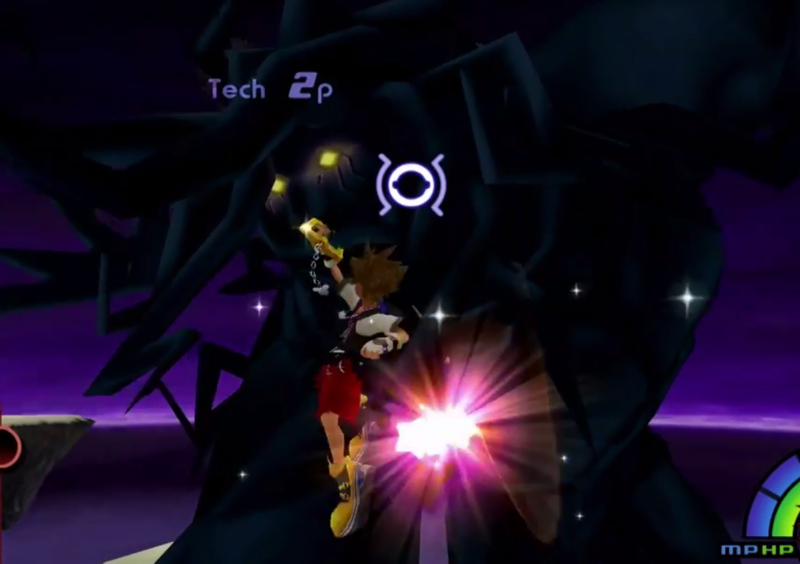 In the Darkside boss battle, Sora gets a tech point each time he strikes the bosses head, which can be challenging to reach (climbing up his arm). Nothing is forcing players to do it, normal players can get by just fine without ever even noticing you could attack the head. But for players who want that extra challenge, going after Tech points makes the battle a little more challenging and a little more rewarding. Tech points give people a reason to explore combat situations. It can be fun to figure out how to get Tech points for certain enemies, like stumbling on Darkside’s head and being rewarded for thinking outside the box with a Tech point. Another example could be reflecting Cerberus’s fireballs back at him. Players rewarded with tech points in the past by parrying attacks will be the ones to think reflecting a fireball and when they find it, it’s incredible! Since players are exploring combat and playing in riskier situations, they are getting better at the game. Now, with there newfound skill, they can do more cool things in battle which reinforces their enjoyment of the game and provides more varied combat to keep the player in flow. How could they be improved? Tech points increasing combat exploration sounds great in theory, but in practice, the game doesn’t follow through with it as much as it could. It’s disappointing because Kingdom Hearts has fairly deep combat that players never have a reason to explore because Attack-Cure is such a dominant strategy, leading to people calling the game a hack-and-slash. Summons and advanced magic are features that make the combat deeper as can be seen with speedrunners using these mechanics. Most novice players rarely ever use these mechanics because they don’t see the advantage of it, which is because they haven’t practiced it, which becomes a loop that causes people never to use it. Tech points could’ve been one way for developers to reward playing with summons and advanced magic to help players learn how to use these mechanics. Unfortunately, the only non-mushroom advanced magic tech point is for using Gravity on a Yellow Opera, which the player won’t even have the first time they encounter them. Playing physically tends to yield more Tech points than magically, leading to people to focus even more on physical attacks and save magic for healing because the behavior is reinforced. You could see these higher skilled players skipping more normal battles, which means the XP they get from Tech points would balance out with the XP they’re not getting in the battles they skip. Although, there’s no control here. A low skilled player may skip more battles ending in a boss that is too frustrating, or a high-skilled player might do all battles leading to a boring situation (which may be more likely because you can’t open chests while enemies are present). At least Tech points would allow higher skilled players to move faster through the game if they wish, which is a core element of flow control for high-skilled players. Overall, I don’t think it’s too much positive feedback. In a game like Kingdom Hearts, XP is a nice simple reward for Tech points and anything else might be strange enough for low-skilled players to not even care about. At least here, they have a reason to try to parry sometimes. One consideration that could be an improvement: Synthesis items as rewards for Tech points. If I could go through the game and get all the synth items I need from bosses just for getting certain tech points, I’d be thrilled in the end game that I don’t have to deal with the random drops. Why weren’t they used in future games? For Challenge Layering – Well, in KH2, the main mechanic that encourages challenge layering is the controversial MP System. It has an advantage over Tech points for the developers: Tech points need to be hard-coded into every enemy encounter whereas the MP system is always present helping players stay in flow. One difference is the MP system is that low-skilled players are forced to be limited by the MP system while Tech points are more of a pure reward that can be used by either low or highly skilled players. It’s a psychological difference that causes more people to despise the MP system even if it encourages more interesting decisions. To explore different combat variations – In KH2, there might not have been much reason to explore combat variations either. Situation Commands changed that in KH 0.2. These seem like a great way to explore combat, but we’ll have to wait for Kingdom Hearts 3 to see how it evolves in the full game. Tech points in KH1 provided fun challenge layering helping multiple player types stay in flow. It may have helped players explore physical combat and get better at parrying and guarding but at the trade of advanced magic and summoning mechanics. 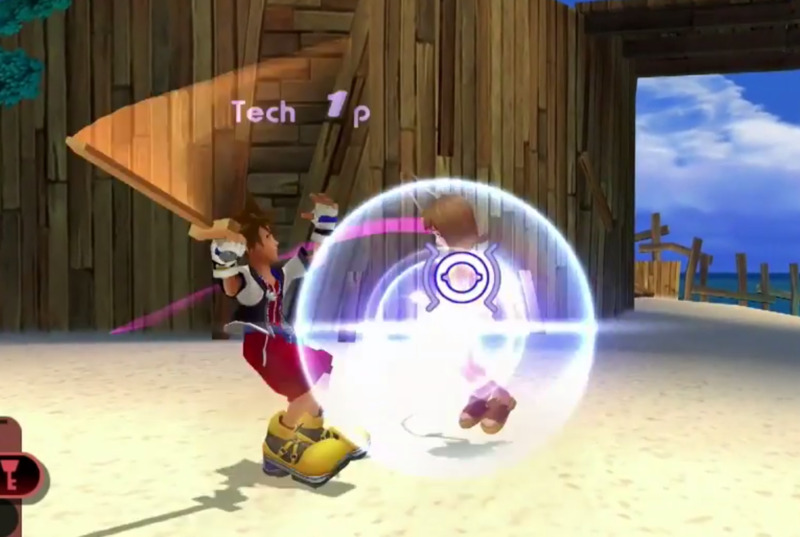 In later KH games, developers replaced the challenge layering offered by Tech points with other means and may have struggled thinking of ways to use Tech points to encourage variation in combat. Actually, Tech Points (as they exist in KH1) are not in KH2. Maybe you are thinking of Ability Points (the things you use to equip Abilities)?